If you and your mates are keen to trade big nights out for cosy nights in with Netflix this month, we’ve got the perfect companion: Pizza Hut has just launched the Limo Pizza and you need it in your life. The Limo Pizza is a whopping 36 slices of pure pizza goodness, and you can choose up to three toppings from a huge selection – perfect for pleasing even your fussiest friends. It serves up to eight people too – so there’s more than enough to go round. You can then add three sauces of your choice – all for just Dhs65. It’s available for takeaway, or dine in. So, either invite all your mates round to yours for a binge-watching, binge-eating pizza party, or head out to one of Pizza Hut’s UAE branches and enjoy it in store. 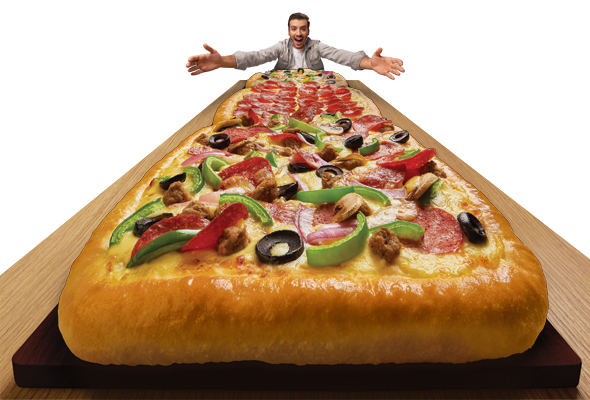 Either way, it comes in the metre-long pizza box – so there’s no wonder you won’t be getting that on the back of a bike.